Leading opposition figure Freddy Guevara has sought refuge in the Chilean embassy after being blamed by Venezuela's government of fomenting violence. A UN report blames the government for the scores of protester deaths. A leading member of Venezuela's opposition has sought refuge in the Chilean embassy after being threatened with arrest by the country's high court. Congressman Freddy Guevara, 31, entered the Chilean ambassador's residence in Caracas with his girlfriend late Saturday. His arrival ended a drama that lasted more than 24 hours when he went into hiding as intelligence police vehicles surrounded his house. All was quiet Sunday morning outside the ambassador's residence, which is located in a gated community, except for neighbors walking to the golf course. The Supreme Court, which is packed with government loyalists, barred Guevara from leaving the country and asked the Constitutional Assembly, which is also packed with government supporters, to strip Guevara of his immunity from prosecution. The government of embattled President Nicolas Maduro has accused Guevara of fomenting turmoil and other crimes during months of ongoing anti-government protests. By law, the National Assembly, which is controlled by the opposition, is tasked with determining whether a legislator's constitutional immunity should be lifted. But the court has instead handed the case to the Constitutional Assembly, which has been given virtually unlimited powers. Guevara, a vice president of the congress, was a leading member of the political opposition that brought hundreds of thousands of angry Venezuelans into the streets - many of them furious about Maduro's increasingly authoritarian rule and a collapsing economy. Guevara's Popular Will party called the government accusations against him "nonexistent crimes invented by the dictatorship." On Saturday, 12 governments — including Mexico, Brazil and Canada — issued a joint statement slamming Venezuela's high court for targeting Guevara, calling it a "new blow to the rule of law and separation of powers in Venezuela." The high court has blamed Guevara for the deaths that occurred during anti-government demonstrations. But Guevara had called for peaceful protests and a United Nations report blamed the deaths on state security forces. 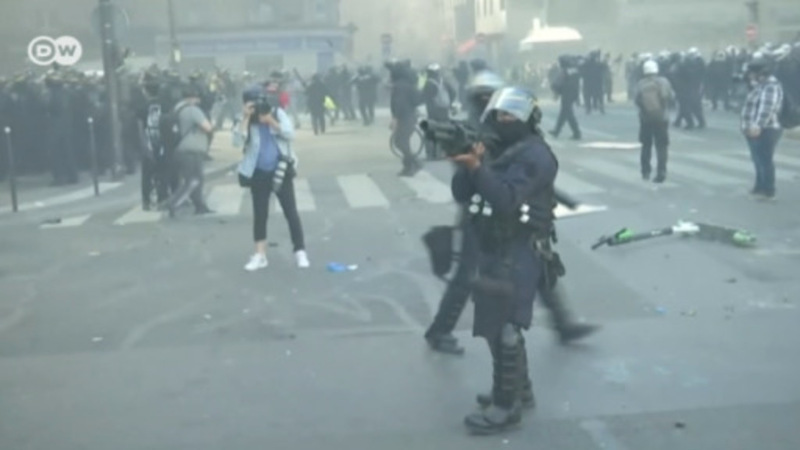 More than 120 people have died since protests turned violent in April. The government did not immediately respond to the accusations. Chile was at the center of similar diplomatic dispute earlier this year when five judges appointed by the National Assembly to replace government loyalists on the Supreme Court sought asylum in the ambassador's residence after a warrant was issued for their arrest. The Venezuelan government considered the judges as usurpers and never granted them safe passage to take up exile in Chile. After being holed-up in the diplomatic compound for more than two-months they left the residence of their own accord last month. They were secretly ferried across the border to Colombia and from there they flew to Santiago, Chile. Venezuela has the world's largest oil reserves, but is battling an unprecedented economic crisis fed by runaway inflation. Despite declaring himself the interim president, Juan Guaido is not a household name in Venezuela's opposition, but he has been at the forefront of one of the boldest moves against Nicolas Maduro. How did he get there?